This map is a product of a cooperative project of the U.S. Geological Survey, the U.S. National Park Service, and the Bureau of Land Management to provide geologic map coverage and regional geologic information for visitor services and resource management of Grand Canyon National Park, Lake Mead National Recreation Area, Grand Canyon-Parashant-National Monument, and adjacent lands in northwestern Arizona. This map is a synthesis of previous and new geologic mapping that encompasses the Peach Springs 30’ x 60’ quadrangle, Arizona. The geologic data will support future geologic, biologic, hydrologic, and other science resource studies of this area conducted by the National Park Service, the Hualapai Indian Tribe, the Bureau of Land Management, the State of Arizona, and private organizations. 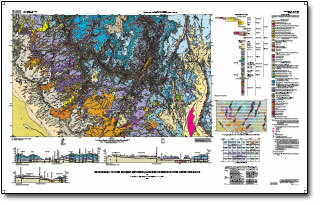 Billingsley, G.H., Block, D.L., and Dyer, H.C., 2006, Geologic map of the Peach Springs 30' x 60' quadrangle, Mohave and Coconino Counties, northwestern Arizona: U.S. Geological Survey Scientific Investigations Map 2900, https://pubs.usgs.gov/sim/2006/2900/.